The HYS-58 quickly generates its own steam using only tap water. A special filter resin prevents clogging. New Conex heat canopy deflects heat rise, keeping handle cool. Temperature control is accurate to 2 degrees. Safe for any fabric. Comes complete with water tank, filter resin, water hose and iron rest. Specially designed for use in garment factory, laundry and dry cleaners, apparel and alteration stores, boutiques, department stores, hotels, hospitals, etc. 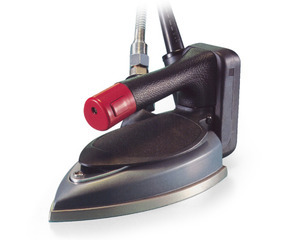 New hard nickel coating means smoother ironing with less resistance, ironing surface cleans easily with just a cloth, and there's no Teflon non stick shoe required! HYS58 Gravity Feed Iron, Water Bottle, Demineralizer, and Optional Iron Shoe. Thank you for your honesty. That is exactly the kind of advice I need. I have had a Silver Star iron in the past but have become spoiled by the Naomoto. I will give this some more consideration. I live in Saskatchewan, Canada, so I know that shipping my iron to and from you for repair will be fairly expensive but what would I be looking at for parts and repair costs? The thermostat is fine but when I press the steam button, next to no steam comes out and if I have the iron turned off but forget to close the water bottle valve, water pours out of the iron as soon as I turn the iron power on. We are extremely happy with the Naomoto HYS-58 Iron. It's a little heavier than other, less expensive irons, but it has a sleeker design, is better weighted so it doesn't tip back, and it has a more effective heat shield. The iron also comes with a couple small tools, and instructions on how to troubleshoot and fix minor problems. This iron is highly recommendable!